If you somehow don't know the name Daveed Diggs, then you've either been living in a cave for the last five years or you're not a big Broadway musical fan. Diggs was one of the breakout actors in the smash hit musical Hamilton and he's successfully transitioned to the silver screen with much aplomb. Best known for his wild shock of hair (I bet that helps some of you to pinpoint Diggs), his acting chops were never in question, but with this week's release Blindspotting Daveed Diggs adds writer and producer to his ever-expanding resumé. 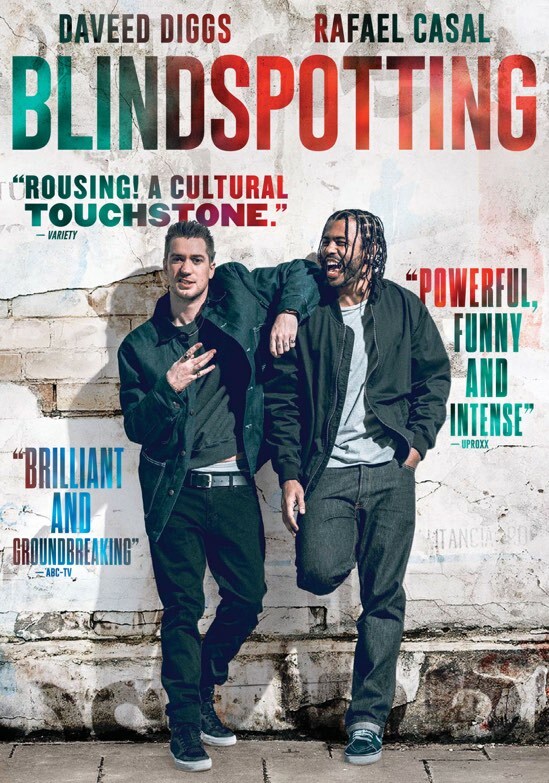 Diggs wrote the script for Blindspotting with his childhood friend and co-star Rafael Casal back in the mid-2000s, but it's a sad reminder of our current state of things in America that the film is as relevant now as it was then, perhaps more so. The story is a reflection of the hostile racial politics that is ensnaring the United States more and more each day. Diggs stars as Collin, a parolee who is facing his last three days of probation and is finding it increasingly difficult to stay clear of trouble. It seems that the current political landscape has escalated race relations to a new boiling point that we had hoped was a thing of the past. Now it's hard to turn on the TV without being reminded that the events that we had only previously seen in movies and documentaries are back to tarnish our country's reputation. Have we not learned anything from our history? 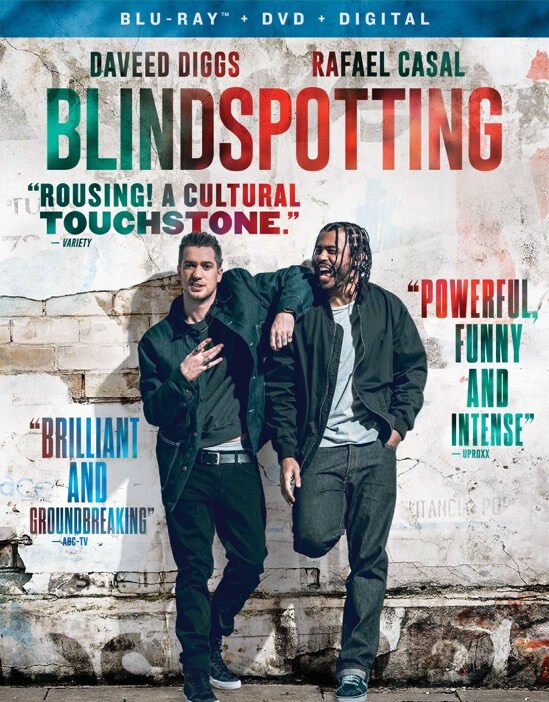 Well, perhaps this country needs to sit down and watch Blindspotting as it is both an entertaining and compelling film that shines a spotlight on many of the issues that are dividing us. The fact that the screenplay is over a decade old only underscores how much of a slippery slope that we are on as a country. While Blindspotting doesn't have a cure-all (is there even one at this point? ), the movie does bring up poignant points about how we are all impacted by our racial inequality every day. Collin is just trying to survive the last three days of his probation while his Caucasian best friend does his best to fit in, even being accused of cultural appropriation at one point. It's clear that their relationship is a microcosm of the conflict in this country and when it comes to a head in the film, that open understanding might eventually lead to our collective healing. Diggs and Casal are breakout stars that prove that this won't simply be a flash in the pan. Both of them bring an authenticity to the role that not only helps to sell the buddy comedy parts, but also the painful cultural divide parts. The audience believes their pain and conflict because it's clear that they have been confronted with the film's reality in their daily lives. Or at least they know someone who has. And that's the real message from this film. No matter how different we are, we share a common goal of humanity with a social contract that someone got perverted from the time of our forefathers. Daveed does get some help from one of his Hamilton castmates as Jasmine Cephas Jones plays the mother of Miles' young son. Her performance is also exquisite and it's clear that we will be seeing the original cast of Hamilton breakthrough in Hollywood for years to come. I won't lie, Blindspotting is a tough, uncomfortable watch but one that needs to be seen by as many people as possible. Sometimes it seems that we lose sight of the forest for the trees, but we are one country and we will only achieve our greatest incarnation when we come together as one. This movie is one that might help to bridge that gap and bring us closer to our best selves. Blindspotting is now available on Blu-ray and DVD.